Kelly DuMar – who is teaching the online class “Your Memoir as Monologue” starting Jan. 4 — is a poet, playwright and expressive arts workshop facilitator who loves leading new and experienced writers through dynamic writing exercises and meaningful sharing that leave you feeling engaged, intrigued and surprised by the depth of your experience. Her award-winning plays have been produced around the US and Canada, and are published by Brooklyn, Heuer, Youth Plays, and Smith & Kraus Audition Anthologies. She’s also author of a non-fiction book, Before You Forget: The Wisdom of Writing Diaries for Your Children, and a chapbook, All These Cures. Kelly has been a leader of new play development in the Boston area for over a decade, and she founded and produces the Our Voices Festival of Women Playwrights at Wellesley College, now in its 10th year. She’s a certified psychodramatist and a playback theatre artist. 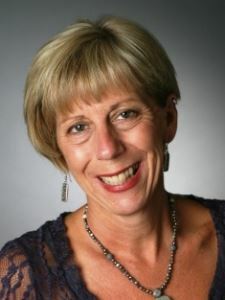 Kelly is honored to serve on the board of The International Women’s Writing Guild and the TLA Council, and she facilitates Let’s Talk TLA, a bi-monthly teleconference where she interviews a notable TLA practitioner. Here’s a brief interview she did with Caryn Mirriam-Goldberg. 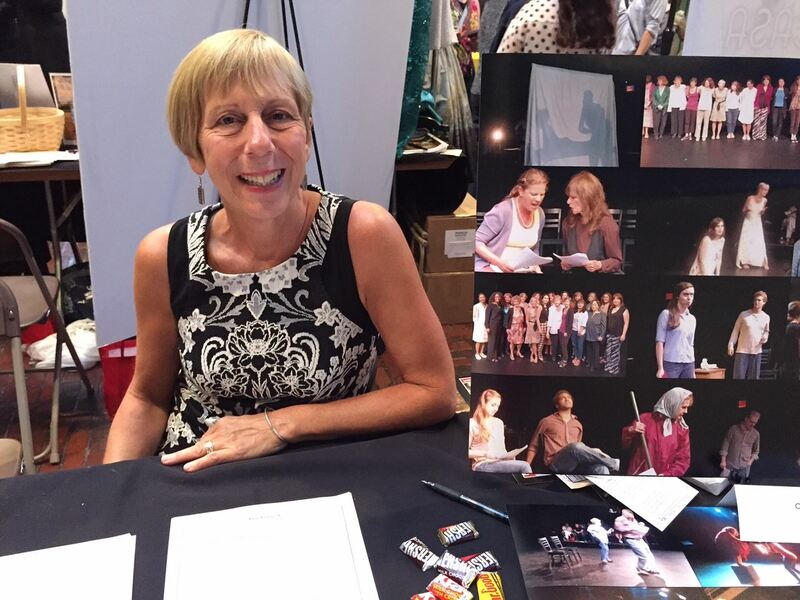 Caryn Mirriam-Goldberg (CMG): What inspired you to put together this class? CMG: How would this class potentially benefit students? KD: We need to re-learn how to be playful as adults. In my training as a creative arts counselor, I discovered the healing power of imagination. I saw how the joy and power of dramatic play could help people heal, grow and change. The dynamic skills I learned and practiced as a psychotherapist have helped me grow as a creative writer and I use them to help writers of all kinds. My workshops involve unique, playful, surprising ways to evoke storytelling. I believe workshop experiences should be safe places for self-expression where feedback is non-judgmental and encouraging. 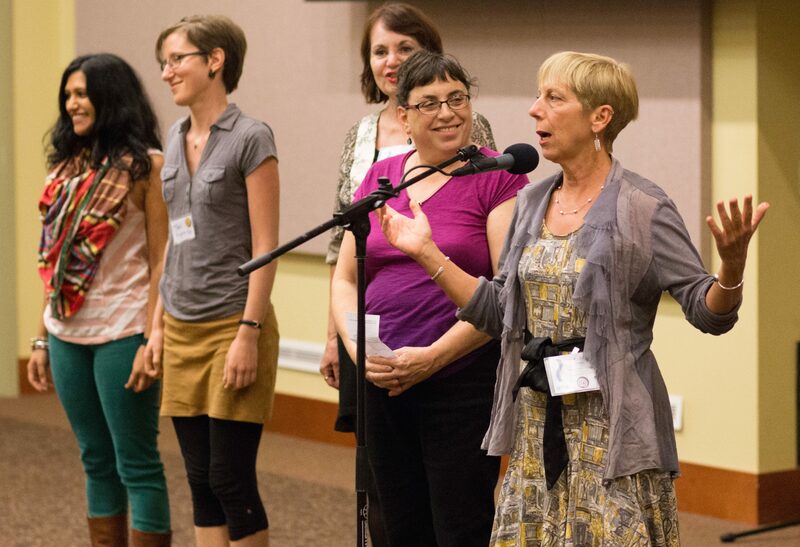 Kelly at the Power of Words conference while Caryn Mirriam-Goldberg, ronda Miller, Teri Grunthaner, and Seema Reza look on. It’s empowering to believe we’re creative. I grew up thinking I wasn’t creative and wishing I was. It was only when I took risks to get out of my comfort zone that I opened the door to a creative life. So many people think they aren’t creative, but everyone is. Creative energy gets blocked for a lot of reasons. It can be unblocked pretty easily in a playful, fail-safe environment. The healing power of writing is real and accessible. People are so amazingly resilient! Writing is a natural way to find out how resilient you are – and sharing what you write inspires other people to feel hopeful and resilient. We need support to grow as writers. A creative life is risky business, and every writer needs a support system to thrive. I wrote my first short play when I was forty years old without any guidance. I soon found a playwriting group in Boston, Playwrights’ Platform. I was afraid to open my mouth for the first few meetings, but Playwrights’ Platform soon hurled me into writing, critiquing, directing and producing plays and theatre festivals. Our small first steps can have a big impact. CMG: How has doing this practice helped you develop your art of words, and a better sense of how to live meaningfully? KD: I love monologues. Listening to them, helping others write them, and writing them myself. First person narratives are gripping invitations to audiences, particularly when they present a dramatic journey, and moments of survival of someone – a person, a character – who has enlisted my compassion and concern. CMG: What do you love most about this work? KD: The invitation to enchantment. The theatre, darkened, the stage lit. Whether I’m in the audience or behind the scenes, I’m involved and transported by possibility. The theatrical question explored, What if. . . is my invitation to change others and be change myself, through storytelling. CMG: How did you find your way into your TLA passions? KD: As a psychodramatist and playback theatre artist, playwright and poet, I naturally gravitate to making connections with other writer/artists/helpers. Psychodrama is the most powerful method I’ve encountered of helping people use imagination to grow. I grew up writing and wanting to be a writer, but chose to pursue graduate school as a “helper” instead. Soon, my training in psychodrama gave me access to my imagination, and it was only then, I feel, that I really began writing what I call my truth and beauty. Find out more about Your Memoir as Monologue: How to Create Dynamic Dramatic Monologues About Healing and Transformation for Performance at http://tlanetwork.org. Special holiday discount if registered by 1/1/16. I have a new item on my bucket list: After attending your Women’s Voices Festival, I would like to join the group someday as a new, enthusiastic writer. I know this group is mostly for Boston playwrights but I hope there can be an exception. I’m busy trying to find my way into a learning experience that will nurture and challenge me. I live in Central Florida. Hi Eliana! I’d love for you to contact me directly at kellydumar@kellydumar.com! Thanks for writing about your interest! Let’s chat!